Cassava (Manihot esculenta) is a perennial woody shrub with edible roots, which grows in tropical and subtropical areas of the world. In large areas of sub-Saharan Africa, and in parts of Latin America and southeast Asia, cassava provides a major daily source of dietary energy. Because cassava roots can be stored in the ground (while still intact on the growing plant) for up to 24 months or more: harvest may be delayed until market, processing or other conditions are favourable. Once harvested, the roots spoil quickly and must be eaten or processed within seven days to preserve their nutritional value. Processing varies according to local customs and generally involves washing, cooking, grinding, drying or fermenting, or some combination of these. The crop has been cultivated in tropical America for probably about 10,000 years. The origin of the species is unknown, but recent taxonomic and molecular evidence suggests it was first domesticated in the southern Amazon. It was introduced to Africa by Portuguese traders during the 16th century and later to Asia, both from Africa and from the Americas. It is now grown in more than 90 countries and provides food and income for 500 million people in the developing world. It is estimated to be grown on 18.7 million hectares, yielding about 233 million tonnes of roots annually. 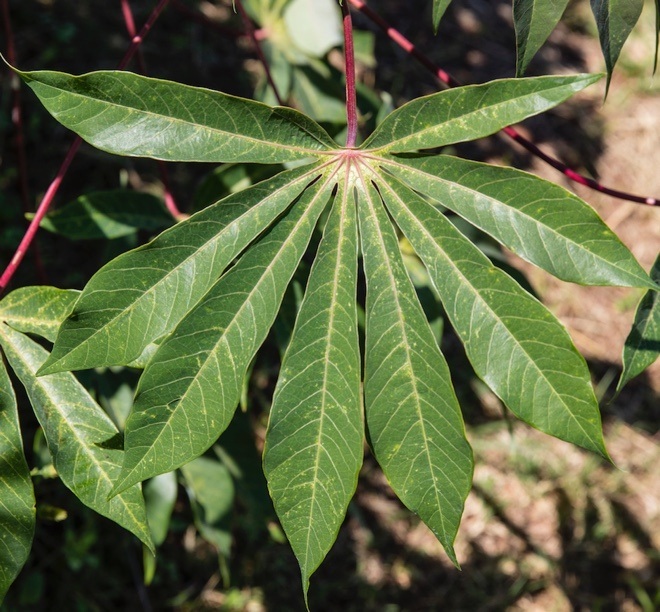 Cassava has the ability to grow on marginal lands, especially in drought-prone conditions and in low fertility, acid soils, where cereals and other crops do not thrive. Cassava is also called yuca, manioc and mandioca, along with many other local names. All known cultivars of cassava belong to the species M. esculenta. The genus Manihot is morphologically very diverse, containing herbs, shrubs and trees. Most of the species are shade-intolerant and tend to be invaders of forest borders or of open areas, where they do not need to compete with other species for sunlight. Many produce storage roots, where starch reserves accumulate to help the plant endure difficult periods, especially drought. Genetic resources of cassava comprise local or introduced landraces, improved cultivars, genetic stocks and related wild relatives, of which there are 98 species. The wild species are mostly seed-propagated and many are very difficult to propagate vegetatively. Cassava has relatively few improved varieties, partly because there are few major breeding programs. Most cassava germplasm in cultivation is still based on landrace varieties. It is estimated that nearly 2/3 of the genetic diversity of cassava exists only in situ, with only 1/3 being securely conserved ex situ. The combinations of genes currently found in cassava landraces are a result of many centuries of farmers’ selection. Since cassava is highly heterozygous, the only way to preserve these specific gene combinations is through vegetative propagation. Landraces sometimes do produce seeds, which may also be conserved. Germplasm can be maintained vegetatively in fields or screenhouses (field banks) or in vitro (slow growth tissue culture or cryopreservation). Seeds can also be conserved at low temperature and humidity and with cryopreservation techniques. Genes can also be maintained for further use in the form of DNA or cryopreserved pollen. Wild Manihot species are conserved mainly in seed genebanks or as plants in the field. Since they are perennials, field genebanks may be maintained for long periods without regeneration if conditions are appropriate. 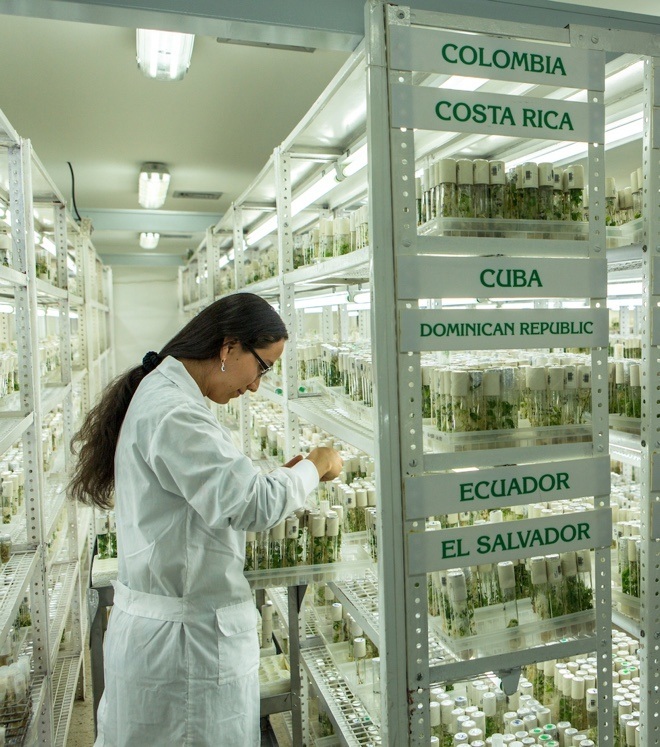 Generally, wild Manihot field genebanks are planted or regenerated using seed. Some of the species have been successfully conserved and propagated in vitro; however each species appears to have unique optimum media and environmental conditions, and the research to define the suitable conditions has been done for only a relatively few species. Cassava is mostly propagated vegetatively by stem cuttings, so the multiplication rate is much lower than for seed-propagated cereals. In addition to the constraint imposed by a low multiplication rate, cassava stem cuttings are bulky, difficult to transport and highly perishable: they may begin to dry out and lose viability within a few days after harvest. Moreover, phytosanitary regulations prohibit the movement of cassava stem cuttings across international borders (to prevent the spread of diseases and insects). Special arrangements have to be made for storage and transportation of germplasm. The largest ex situ cassava collections are held in vitro by CIAT with about 6,500 accessions and IITA with about 3,700 accessions. There are probably more than 10,000 unique accessions conserved ex situ, in the more than 70 cassava genebanks worldwide. EMBRAPA-Brazil holds about 4,000 accessions. Other important genebanks are those in CTCRI-India , INIA-Peru, NRCRI-Nigeria, IAN-Paraguay, SRCV-Benin, D.R. Congo and PGRC/CRI-Ghana. A few genebanks (mainly EMBRAPA, Brazil and CIAT) have seed banks to conserve seeds of wild species or breeding material. A few are also initiating DNA banks. Allem AC. 2002. The origins and taxonomy of cassava. In: Hillocks RJ, Thresh JM, Bellotti AC, editors. Cassava: Biology, Production and Utilization. CABI, New York. pp. 1–16. Debouck DG. 1991. Genetic variation in crop species and their wild relatives: a viewpoint for their conservation. In: Becker B, editor. Genetic diversity and crop strategies for roots and tubers. Arbeitsgemeinschaft Tropische und Subtropische Agrarforschung e.V. and International Board for Plant Genetic Resources, Bonn, Germany, pp. 41–51. Epperson JE, Pachico DH, Guevara CL. 1997. A cost analysis of maintaining cassava plant genetic resources. Crop Science 37(5): 1641–1649. Rogers DJ, Appan SG. 1973. Manihot, Manihotoides (Euphorbiaceae), Flora Neotropica, Monograph no. 13. Hafner Press, New York. 272 pp. Contributors: CIAT, Colombia (Daniel Debouck); IITA, Nigeria (Dominique Dumet); Bioversity International/ILRI, Ethiopia (Alexandra Jorge); independent consultant (Clair Hershey); INIA, Peru (Llerme Rios). Information on best practices for genebank management of cassava genetic resources was gathered from current genebank practices and accumulated experience from CIAT and IITA, reviews from the literature and existing websites of major cassava genebanks (EMBRAPA, Brazil; INIA, Peru), as well as valuable information from independent cassava consultants.